Light filled & spacious with a wonderful floorplan that offers lots of flexibility! Features include a family room off the kitchen, large living and dining rooms & roomy bedrooms that are entered by going up a few steps from the living area for extra privacy. There is a bedroom/den downstairs too. Notice the fresh interior paint, and gleaming refinished hardwood floors. Lots of extra storage below and a large yard. Enjoy the views towards the bay and airport especially at night. 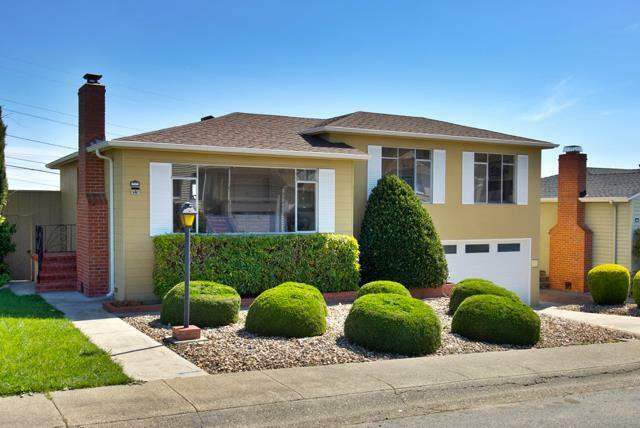 Be so close to schools, churches, 280/380/101 freeways, San Bruno BART, Caltrain, Bayhill & Tanforan Centers and SFO..This is the first time this home has been on the market in about 60 years so this is truly a special opportunity.